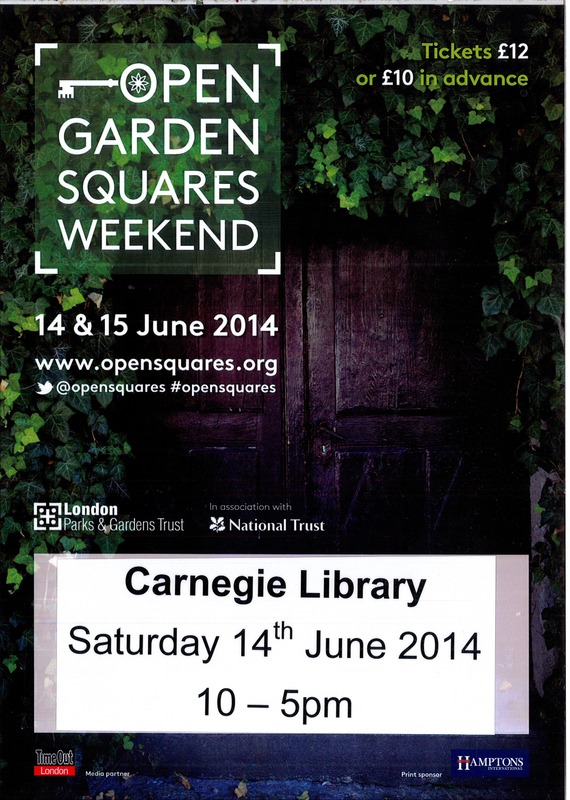 On Saturday 14th June we are once again proud to be taking part in this well-established annual event. Over the past seven years the Friends of Carnegie Library have renovated the formerly derelict enclosed garden at the rear of the library, in co-operation with Lambeth Council and with funding from the Big Lottery Fund under the BBC Breathing Places scheme and the Metropolitan Public Gardens Association. We'll be open 10am - 5pm, with refreshments, display on the history & development of the garden, self-guide tour notes and occasional guided tours. All are welcome. 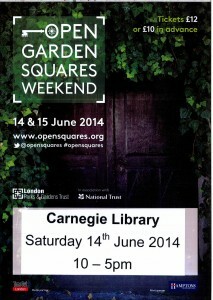 Entry to the Carnegie Reading & Wildlife Garden is free, but we will also have a limited number of tickets + guide books for the overall London-wide Open Garden Squares Weekend , which allows entry to hundreds of venues in greater London. Tickets are £10 in advance, £12 on the day, £6 for National Trust members. Children 12 and under free.